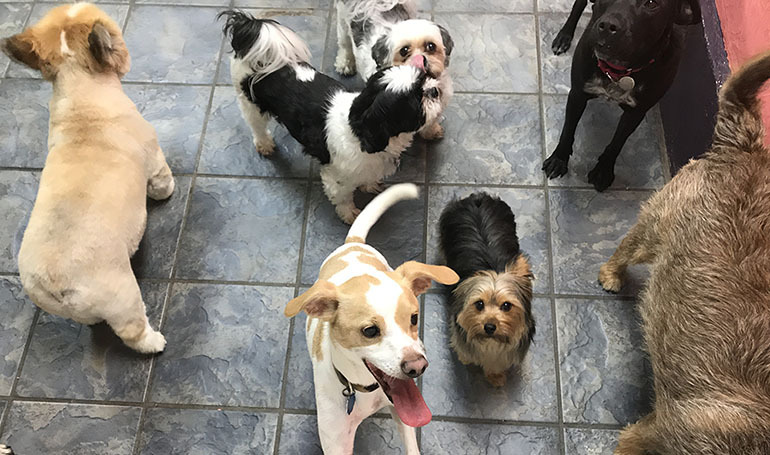 Our indoor playroom is supervised by trained staff who ensure that your dog has a great time. There are toys, playground equipment, balls, fellow dogs to play with and comfy beds for naptime. Each day, field trips to local parks guarantees that your dog gets plenty of fresh air and exercise. Full day, half day and 2 hour drop in play groups are available 7:00 am to 6 pm Monday thru Friday. We’re located right in the heart of Winthrop, MA – super convenient to East Boston, Revere, Everett and Logan Airport! Over 6 months of age and be spayed or neutered. Currently on a flea/tick prevention. Identification tags and appropriate collar/harness & leash. Must be living in your home for at least 30 day before qualifying for daycare. 2 hour playgroup required to evaluate new dogs. Vaccinations required: Distemper-Parvo, Rabies and Bordatella. 10 Full Day (Up to 11 hours) $295.00. 10 Half Day (Up to 5 hours) $225.00.